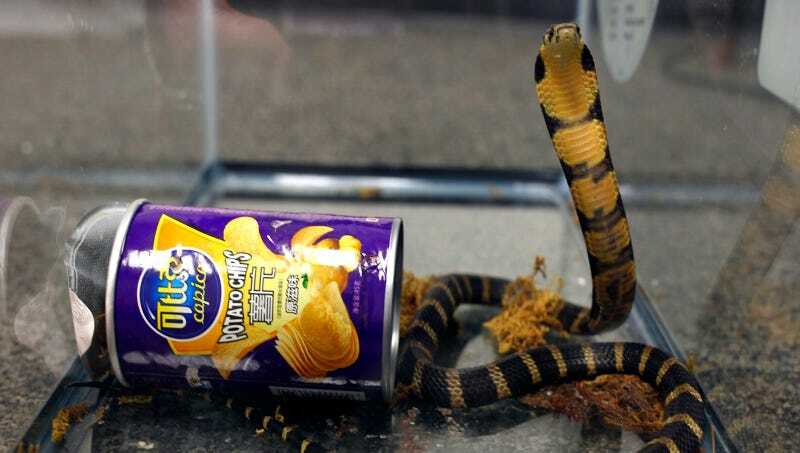 A man named Rodrigo Franco of Monterey Park, California, is potentially facing 20 years in federal prison for his involvement in a recreation of the fake snakes in peanut brittle gag with actual deadly King Cobras jammed into knock-off Pringles containers. KTLA5 reports that Franco was arrested on Tuesday and charged with illegally importing merchandise after receiving a package that contained three cobras in cans and three albino soft-shelled turtles all sent to him from Hong Kong. It must have been a busy day at the post office because Franco was also trying to mail six turtles (three-toed box and ornate box turtles, for the record). What the agents found inside Franco’s home was a twisted petting zoo of protected species bound for illegal markets, according to authorities. His house held a live baby Morelet’s crocodile, alligator snapping turtles, a common snapping turtle and five diamond back terrapins, according to the affidavit. The cobras and turtles are protected by an international agreement that was put in place to protect endangered wildlife. Under questioning, Franco admitted that he’d received a shipment of 20 cobras in the past that all arrived dead. Text conversations between Franco and his Hong Kong contact, Ji Anji, include discussions about how best to get the animals across the Pacific without them being discovered or dying. Potato chip holder is what they landed on. Two of the cobras are being cared for at the Los Angeles Zoo. One died of “unknown causes,” but it seems safe to bet that traveling through the mail had something to do with it. There’s no mention of what happened to the albino turtles.